Living in Beijing it is easy to find the international lifestyle sometimes hectic and chaotic, and combined with the occasionally less than ideal air quality, it is easy to overlook the importance that getting active outside can bring. To help parents with children of all ages, we sat down with Tom McCabe, Primary School Physical Education Teacher for Yew Chung International School of Beijing, to talk about why physical education is so very important for all students. The first and most obvious reason why physical education is important for children is the myriad of positive effects it has one a child’s physical development. With today’s increasingly sedentary and screen based lifestyles, sports and physical activity is a must! Sitting for prolonged periods have proven to be detrimental to the spine and drastically affect one’s metabolism, meaning that removing act of physical excursion can have disastrous effects the growth of an otherwise healthy child. By taking part for a short time with even simplest of physical activities every day, the harmful side effects of modern life and be prevented and effectively reversed. As an added bonus, it has also been undeniably proven to promote a child’s spatial awareness and coordination, something which the living room sofa and television cannot compete with. Becoming athletically involved may do wonders for a child’s growing body, but it also carries with it an amazing number of benefits for a growing mind. 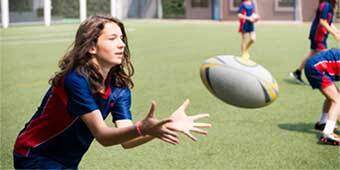 Sports helps develop a number of mental and social skills that are key to your child’s future success. Co-operation, analytical thinking, decision making and sportsmanship are just a few of the skills that sports and athletic education promote. While on the surface they may not seem to improve a child’s gameplay, helping them assess a situation, work together as a team to find a solution and deal with the inevitable highs and lows are critical skills that one needs to succeed not only in sports, but also in life in general. Regardless of whether your child is in primary school, secondary school or kindergarten, it is never too late or too early take up a team sport and enjoy the benefits it can bring! A bigger challenge than scoring that winning goal is actually getting your children motivated enough to able to truly enjoy sports and the best way is do that is by doing it together. Parents are the heroes of their children and if they see you valuing and enjoying sport, there is an infinitely stronger chance that they will as well. While not everyone is sports fan, simply taking a half an hour out of our schedules to play catch or go for a walk with your child is invaluable. As a parent it also gives you the opportunity to take a break from hustle and bustle of Beijing’s daily life and connect with your child on a deeper emotional level. Remember, a family that plays together stays together! To learn more about YCIS Beijing, and get more advice from their international expatriate teachers. Please visit their website by following the link below.